Yes,the egg poacher is the right size for holding the hot cake pan in your hand while you eat the cake right out of the pan. The poacher can also be used to pick up a pot by it's hot handles such as the ones on a 10cm Imusa Mug or even the 12 cm mug. Good name for it..."Backpackers Friend" the thing is heavy duty, really works well for hot pickups. I used my 2 piece aluminum cake pan....don't like it!!! too messy for clean up. The pan is just a tad bigger than the one piece that I had used earlier. Same cake mix and water. I still need to fine tune the system. I can use les water so that the water eill have evaporated and give me a 1/2 min dry bake to get rid of some of the moisture in the cake. Right now the flame goes out at about 6.5 min. Lookin good! Is your wife letting you cook inside again? Wow!!!! I found the perfect egg poacher for the 10cm Imusa Mug. Lid fits perfect also. 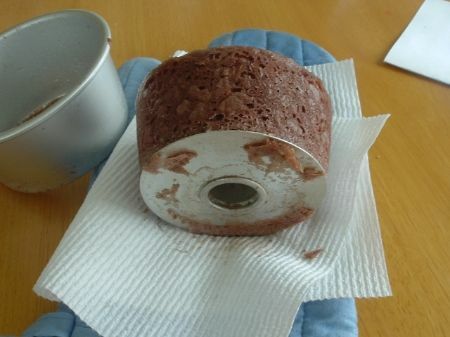 Have not tried making a muffin in it yet. will do while camping and report my findings. It's made of thin gauge stainless steel. This new found mug/pan combo easily cooks 3 eggs. Today I did some experimental baking with it. I baked about 7 muffins to get to the right combination of mix and bake time. Mix in snack size ziplock, cut corner of ziploc and squeeze out mix into greased bake pan. I used coconut oil to grease the pan. Put 1/2" water in Imusa Mug, bring to boil, place pan on top of mug, put lid on, bake for 5 min. The texture is "fine" due to the angle food mix. I'd venture to say "springier" than regular muffin mix. It's not chewy like angel food cake. I like the short baking time. The mix of the 2 cakes was for a Microwavable cake called a three two one cake. 3 parts "basic mix" 2 parts water and 1 min. cook time on high in the microwave. 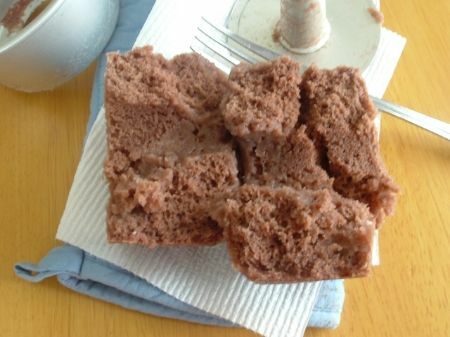 I was impressed with the microwave cake and was inspired to try it with Imusa Mug baking. We always look for "multi use" items to make life easier. I had done some baking with the small angel food cake pan but didn't fit the 10cm mug so I kept my eyes open for something to cook eggs and bake with. I used my kitchen stove for the testing. The use of the StarLyte for Simmer will come next. 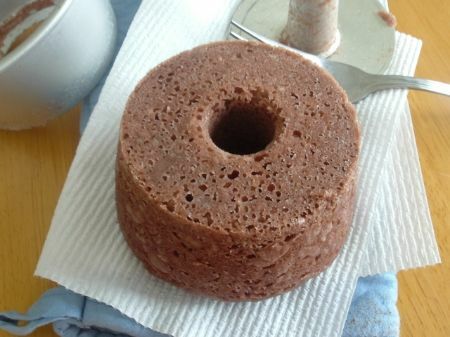 I recommend everyone to try the microwave cake mix just to have on hand for a quick snack. If you feel adventuresome you can try the mix with a backpack size setup of choice. 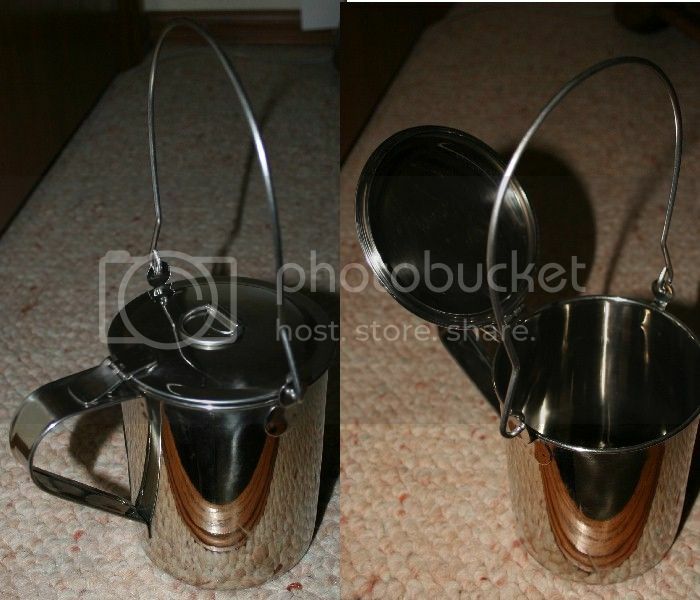 I purchased a dozen of the small stainless steel pans and will offer them along with the Imusa Mugs . One thing I noticed since I've been experimenting with baking is the use of Canola Oil to lubricate the pan to prevent sticking. I ran out of the spray canola and had to resort to coconut oil and margarine. The eggs I made today stuck to the pan when the later oils were used...bummer. So, I'm inclined to believe that the Canola Oil is the best choice at this point. Anyone have a better suggestion for oils? This a photo of 3 eggs cooked for 6 min. using the Imusa Mug. I eat right out of the little pan. Life is good!!! 1/2" of water in the mug is brought to a boil and then pan of eggs is placed on top then cooked for 6 min. Specs:10 oz weight but it is stainless. (I like stainless for dry baking,browning muffins).5" deep/high,4" across(pot portion). 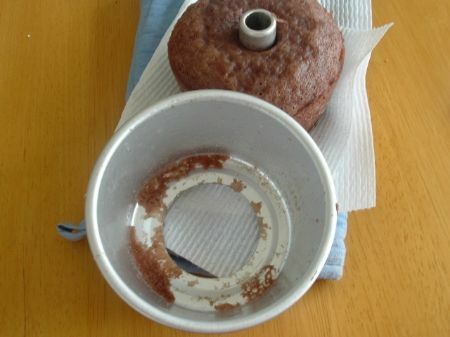 I should have lots of muffin pans for inside that size..3-7/8" max diameter..capacity is 1 qt liquid about 1/4" under the top edge.The lid is hinged off the side handle..but that handle could be removed and the mount tab for the hinge pop-riveted to the pot itself..or leave the lid free...making it more compact.Nice bail! Not a bad sized pot for two of us..$1.75 with sales tax included..